RSD Update: I’m just gonna get this out of the way first. If you read my post on Monday, you’d know that the weekend was really bad, and Monday was the pinnacle. I ended up taking 6 or 7 Percoset pills – the most I’ve ever taken in one day. I went to Physical Therapy yesterday morning feeling like a complete failure. Hobbling in with my crutch was humiliating. It was all I could do to not cry. I have gone so far backwards in my recovery. And the worst part is that I can only figure it was due to the whole “trying on a shoe” thing. A normal-every-day-kind of a thing. So after therapy, I finally decided to call on you, my friends, for a little help from above and asked for prayer on my Facebook status. I never do that. Never. I just feel like this is an issue between me and my family and God. And desperate times call for desperate measures. And you went to Him on my behalf. I felt my discouragement lifting and the pain letting up….a little. But every little bit helps! Now…on to some yummy sweetness! Preheat oven to 350 degrees. In your mixer, cream the sugar, brown sugar, shortening, eggs, and almond flavoring until white and fluffy. Mix dry ingredients in a medium bowl and add to creamed mixture. 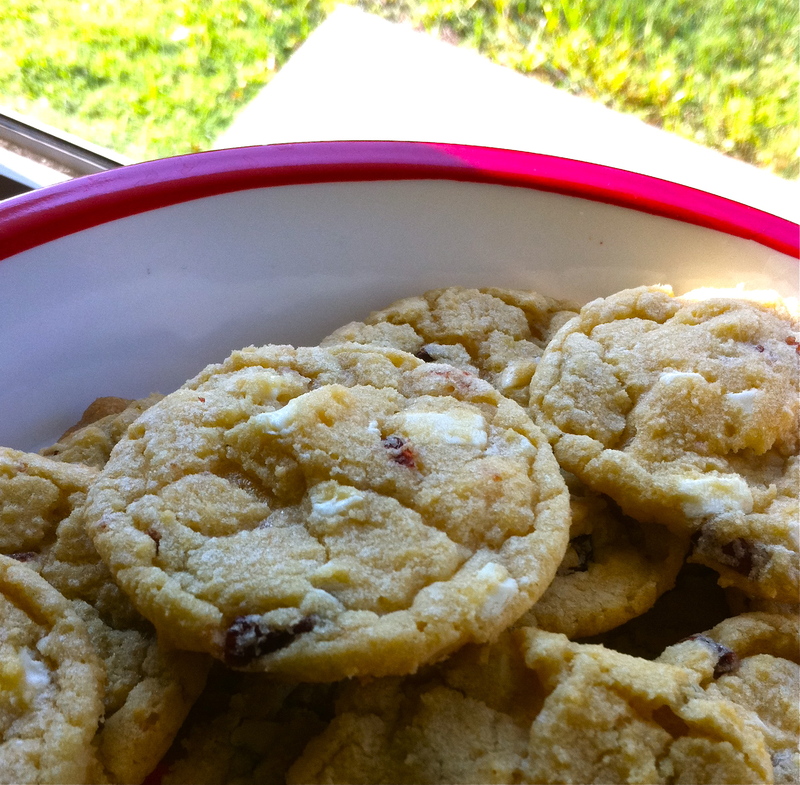 Stir in chopped white chocolate and cranberries. Place tablespoon-sized scoops on baking sheet and bake for 8-10 minutes.